At Choice Auto, we stock a wide selection of wheels for customers in Caledon, Mississauga, Orangeville, Brampton, Toronto, Shelburne, Georgetown, and Erin. Before you start shopping for a new set of wheels, use our wheel buying guide below, and consider the advantages and disadvantages of different wheel materials in order to find the best wheel to suit your needs. If you have any questions during your research, simply contact us online. 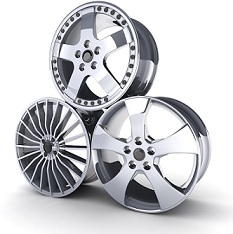 Alloy Wheels are light wheels with improved performance characteristics. These light wheels increase cornering and steering precision, and decrease road feedback for better braking response. Steel Wheels are heavier wheels that provide vehicles with a lower center of gravity. Steel wheels are perfect for harsh road conditions in the snow or off-road over rugged terrain, but lack other performance capabilities because of the added weight. Chrome is an aesthetically pleasing finish applied to both alloy and steel wheels. Chrome wheels are sought by drivers concerned with cosmetic appearance. While chrome wheels are known for their metallic mirrored shine, durability, and strength, they require regular attention and cleaning to maintain their visual appeal. Cast Wheels: Aluminum wheels are manufactured through a process of pouring molten aluminum into a mold. The shape of the wheel is formed through a process of gravity or pressure casting. Machined Wheels: The machining process combines casting, heating, spinning, and precise pressurization to fill a mold with molten aluminum and shape the wheel. Forged Wheels: The forging process takes a solid piece of aluminum and molds the wheel through high heat and extreme pressure. The result is a light, dense, and strong wheel. Size: Various wheel sizes and weights hold different performance characteristics. If you plan on upgrading your current wheel size, be sure to consider the maximum wheel size allowance on your vehicle. Weight: Wheel weight impacts vehicle performance. Heavier wheels increase braking distance and reduce handling, while lighter wheels will improve maneuverability and braking performance. Terrain: Where do you drive most often? Wheels should be selected based on their primary function. Every customer’s criteria for buying wheels is different, so we urge you to contact us with your questions or concerns. Our service staff is comprised of wheel and rim experts who remain on the cutting edge of wheel style, configuration, and performance. For the best wheel buying experience around, contact us today.